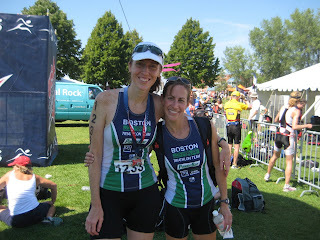 As the saying goes, the third time is charm, and I guess that was true for me in Burlington,VT for Age Group Nationals. After not being able to race in '05 (race canceled due to bad thunderstorms) and '07 (flight to Portland, OR canceled due to thunderstorms), this was a chance to drive to the race and stay with a former BTT couple who have settled outside of Burlington (thanks Adam&Steph!). Maggie joined us too, so it was fun with several of us racing. The course was scenic and fair, and it was a sunny day. I was in one of the later waves, which meant we'd be in the thick of things with a race that saw almost 1700 athletes toe the line. This was, by far, the most competitive race I've done in 19 years of triathlon (omg, I'm old), including 2 IMs and the 70.3 championships. To give some perspective, last year there were 58 women who qualified and raced in my age group - this year it almost doubled to 108. USAT had a webinar that answered most of my race-day questions. For race morning there were designated pay parking lots throughout the city so parking was easier than we thought. Bike check-in was on Friday, so on race morning all we had was our race-day gear. Transition was very tight (so much so that I had to move bikes over on the racks during my bike-run transition) and you could only have race essentials - bags had to go to bag check. The swim was in Lake Champlain, a gorgeous setting, and was a great temp! A very technical swim with a lot of buoy turns made it easy to swim off course - many folks also commented on the blinding sun and having trouble seeing. As my wave was treading water and getting ready for the wave start, the announcer commented: "We are happy to welcome the only American to ever win an Olympic medal in the sport of triathlon to your age group... Susan Williams!" There was a collective "huh!?" , and several of us wondered really?! Really. Seemed a little strange for us age groupers to have to race against an Olympian. (See, I told ya the race was competitive! She went on to win.) Some joked... doesn't she have a speaking engagement or something better to do than this? Anyway, the horn blew and off we went. Due to the sun, I went wide after one of the turns and it took some time to get back into line. Besides the right hook I got just before getting out of the water (from another woman in my age group...gotta love the sportsmanship...sigh), I really enjoyed the swim. Bike - The course had a combination of hills, rollers, and flats. At the start and end of the course you ride on the highway, which was a longer, slower incline. I took the time to look around a little and take in the scenery (I know some people don't do that, but for me actually seeing the places I race is part of the fun). Age groups were all intermingled by this point, and the bike course was crowded. There was some drafting but officials were out and taking note, which helped. I was also so impressed and inspired with the number of athletes age 60+ who were out there. Personally, I was nervous about pushing the bike too hard due to a stomach bug I'd been battling. Run - The start of the run course included a challenging .5mi uphill which caused a few around me to walk. I found a rhythm as I ran up and then settled into a pace. I realized I hadn't seen any information about where the water stops or porta-potties would be, but water was every 1-1.5 mi (and FYI if you race next year, there were no porta-potties). The sun was tough and it had gotten hot (early waves got shade). The course was more or less flat, with some slight inclines and declines, and the second half was on a nice, quiet bike path. The vibe at this point was very serious and intense - no one was talking or cheering. Finally reaching the finish area was such a good feeling, as the music and cheering spectators was energizing. For me personally, the race went as well as it could considering I was fighting a stomach bug the week leading up to the race and on race day, which was a disappointment. The race organization was ok, but surprisingly left a bit to be desired - we have some funny stories we can share. The volunteers rocked though! Happy to check this race off my list - not my top performance ever, but truly excited and thankful to have accomplished my goals of qualifying, toeing the line and finishing in a respectable time.